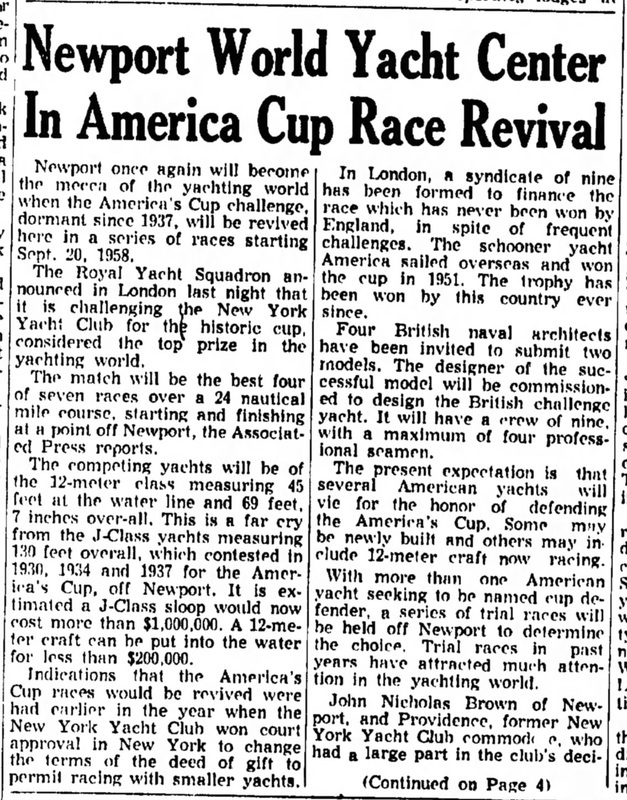 In September Hugh Goodson (member of the Royal Yacht Squadron and Commodore of the Royal Dart Yacht Club) decided to form a syndicate of 12* to build a challenger for the America’s Cup. 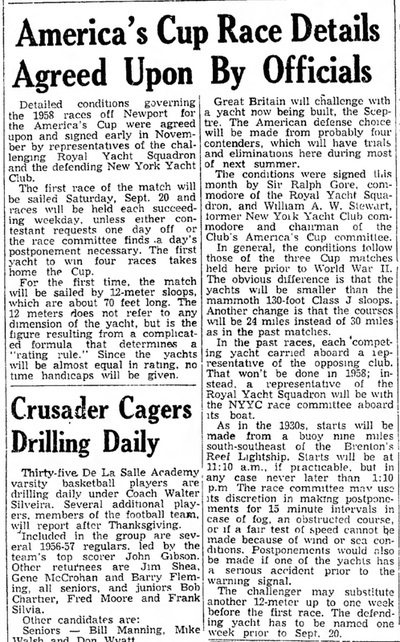 A 165 ton ‘J’ Class boat was too expensive and could not be built in time, so the yacht clubs and sponsors sought a smaller class. 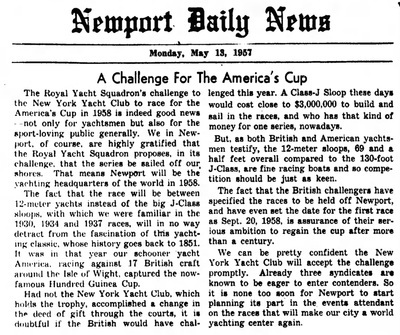 12 Metre racing was well established and several boats existed (in the UK and in the USA) on which to train crews whilst the challenger was built. 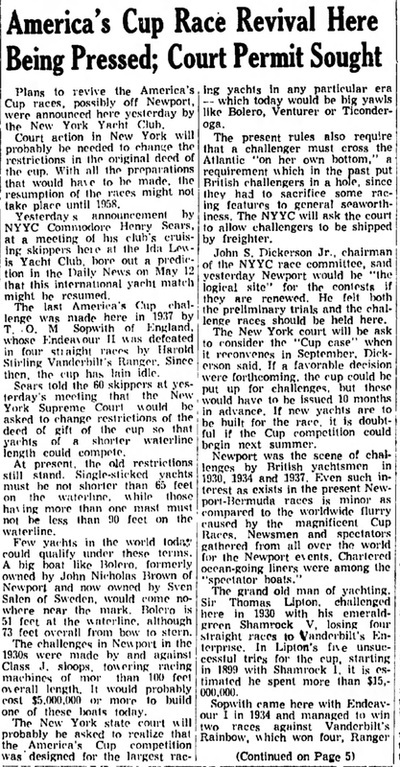 The clause in the Deed of Gift** requiring the challenger to proceed to the race “on her own bottom” was deleted and the length requirement was also changed, so enabling 12 Metre yachts to challenge for the Cup. 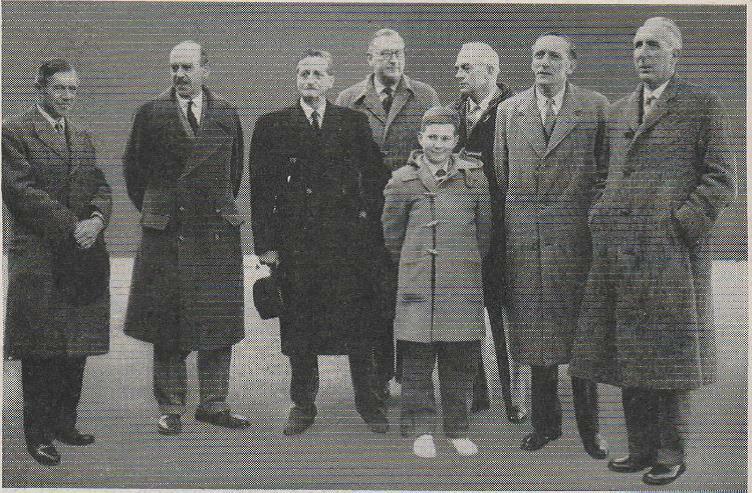 * The original syndicate members were: Hugh Goodson (chair), Viscount Runciman, H A Andreae, Bertram Currie, Group Captain Loel Guinness, Major H W Hall, Sir Peter Hoare, Major Macdonald-Buchanan, Charles Wainman, Viscount Camrose, Lt-Colonel Acland and Sir Joku Wardlaw-Milne. ** The Deed of Gift is a legal document which governs the contest. 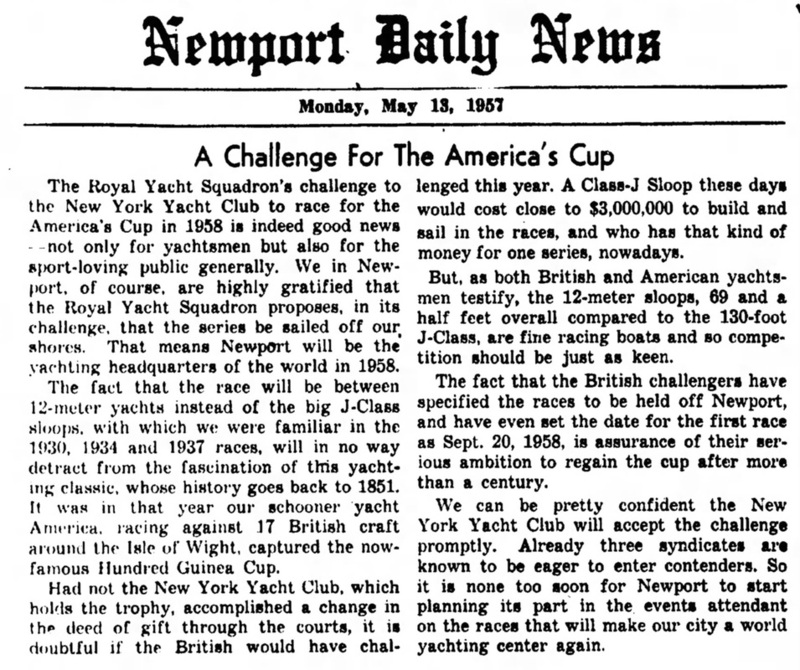 It declares that the Cup (first won by the yacht America at Cowes on 22 August 1985) is “to be preserved as a perpetual challenge cup for friendly competition between foreign countries” and sets out the conditions for anyone wishing to challenge for the cup. 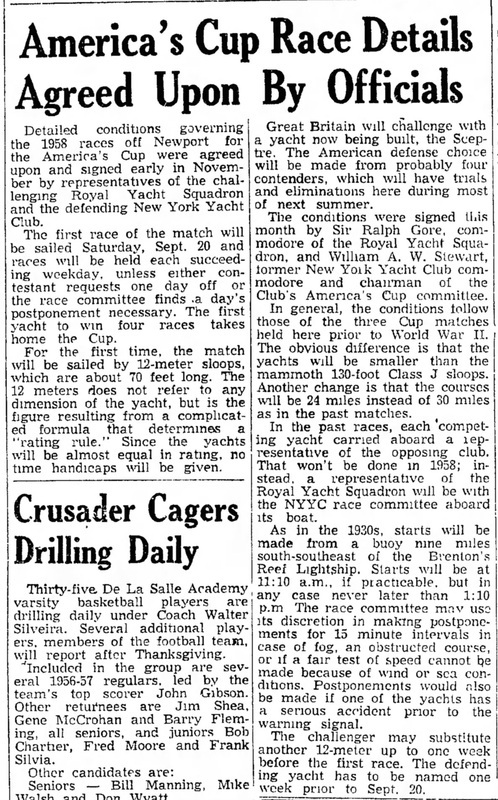 These include notice period, details of the vessel, layout of course etc. It is reproduced in full in Hugh Somerville’s book Sceptre. At the turn of the year, four designers (David Boyd, James McGruer, Charles Nicholson and Arthur Robb) were asked to submit two designs each for tank testing by the deadline of 1 April. 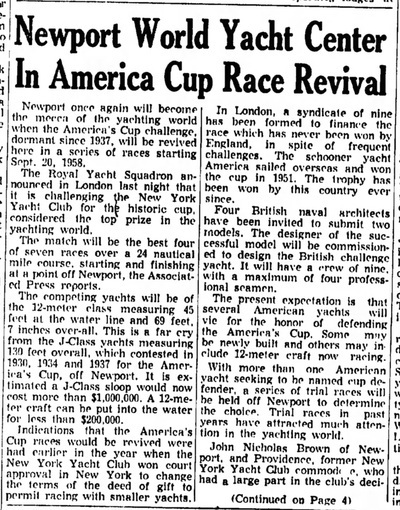 April also saw a New York Yacht Club delegation visit London to thrash out details of the challenge with the RYS. The challenge (the 17th in the America’s Cup history) was made on 14th May. Tank testing at Saunders-Roe (East Cowes) was completed and the syndicate accepted the recommendation to adopt David Boyd’s ‘B’ model on 13th July. 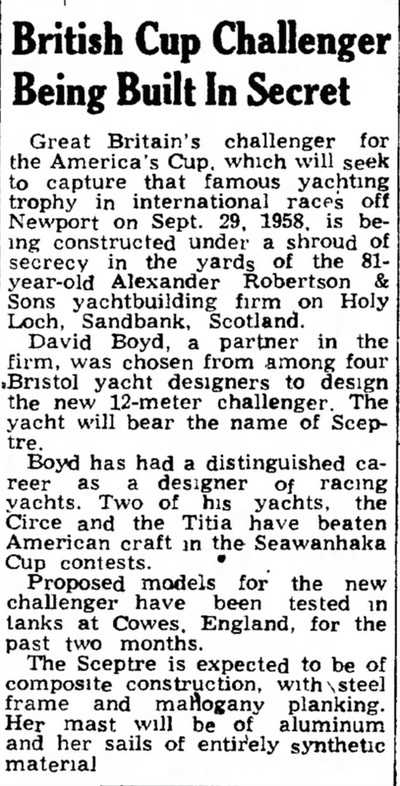 Sceptre started coming together in Alexander Robertson’s Yard (at the head of Holy Loch) in October. The 17-ton lead keel was cast on 10th October and the mild steel frames began to arrive from Millen Brothers of Paisley. By December the backbone was complete. 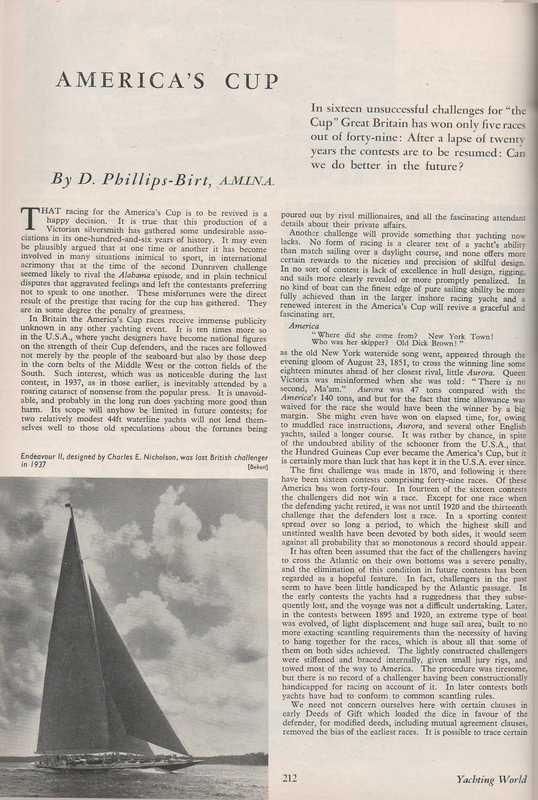 The keel assembly, the alternate steel and oak frames, the spruce shelf and bilge stringer were all in place, and African mahogany hull planking was being laid.